Antitrust policy in the United States and Europe relies increasingly on economic analysis. Economic theory and empirical analysis play a central role in antitrust decisions in the courts and in the formulation and enforcement of policy. Antitrust cases are argued using sophisticated economic thinking; both plaintiffs and defendants in U.S. v. Microsoft, for example, made extensive use of game theory, the economics of information, and transaction cost economics in their arguments. 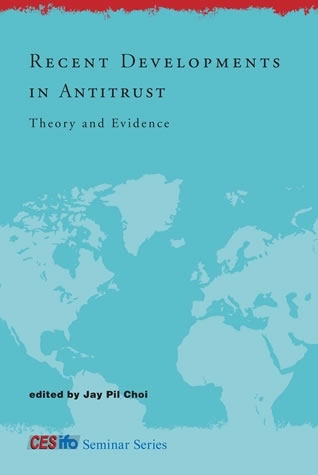 In this CESifo volume, specialists from the United States and the European Union examine conceptual and empirical issues involved in antitrust policy in light of recent developments in the field. The first three chapters address theoretical issues that have been important in recent antitrust actions: durable goods markets, two-sided markets and platform competition, and tying arrangements. Contributors then take up empirical concerns, discussing such topics as bundling and tying as seen in the market for cold and pain-relief medicine; the political aspects of merger control; and market definition and differentiated products in the car and soft drink markets. Contributors also address antitrust and regulatory issues in markets with imperfect information, examining comparative advertising and incentives for information disclosure. The final chapter treats the ownership structure of cable television networks and its effect on competition in the local access market. The importance of economic analysis in antitrust policy makes this overview of recent theoretical and empirical developments essential reading for academics and policymakers.